When you run a beef enterprise as a side-line to a 283-hectare (700-acre) arable business, there are a few essential requirements which must be fulfilled. Not only should the system be simple and quick to run, it also needs to make best use of home-grown feeds and be monitored to achieve optimal performance. Rob Ryle, who runs such a system with his father Willie, on South Acton Farm, Felton, Northumberland, keeps a keen eye on the beef unit's performance as a priority, making sure any extra inputs and effort are worthwhile. With growth rates averaging 1.9kg/day through the final 80-100 days finishing period, there is little doubt the enterprise is easily on target. 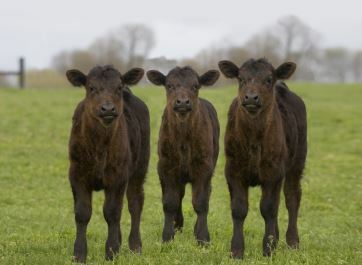 The system the family runs involves buying in 12 to 15-week-old calves through one central rearer, carefully transitioning them to a total mixed ration, keeping them outside at grass for at least one summer, and finishing them indoors by 18-22 months. The cycle begins when dairy cross continental calves, originating through the designated rearer from farms across Cheshire, come on to the farm in batches of 60. Rob says: "They come in as a batch and remain in a batch, and we acclimatise them to our system over several weeks. We keep them on the pellet used by the calf rearer, and after three weeks, we start to transition them to our own grower ration." He says transitioning them carefully over two or three weeks, by the age of five or six months, the switch is complete. By then, young growing cattle are consuming a ration comprimising grass silage (70%), wholecrop barley (20%), rolled beans (5%), pot ale syrup (5%) and minerals. Rob says: "We top up this TMR with 1-2kg/head of a home-grown barley blend fed in the trough. This allows us to use the same TMR for two different groups, which will stay on this ration until about six months of age. After this point, barley will be cut out, but they will stay on the same TMR until aged 15 or 16 months, while they continue to grow frame." During this period, they may go out to grass, without supplementary feed, depending on season. Daily live-weight gain for this growing period averages about 1.1kg/day. It is after this period cattle are switched to a cereal-based, high-intensity finisher ration, which is carefully introduced over a 16-day period. Rob says: "We know from experience if you switch them too quickly or push them too hard, there will be major rumen upsets. We had those issues many years ago when we had acidosis. They would lose condition and we ended up putting more feed into them and gaining less. "For this reason, we ease them on to the finisher ration over 16 days. This means a 70:30 ratio of the grower to finisher ration on days one to three; 60:40 on days four to six; 50:50 on days seven to nine; then the reverse proportions until day 15. "On day 16, they are fully switched to the finisher ration, by which time they have acclimatised well." The high-intensity ration itself comprimises 30% wholecrop barley, 30% urea-treated rolled barley, 30% rolled barley and 10% beans. Like all the farm's TMRs, it also incorporates 0.5kg/head of straw. Rob says: "We introduce 100g/head of live yeast produce, Levucell, with this ration, and find since we started this, the daily liveweight gain has increased." He says this averages out at 1.9kg/day. "We know this because we weigh every batch as we start the switch to the new ration when they have settled on to it. This is usually about 30 days later, by which time they are consuming 16-18kg of the ration per head." John Telfer, account manager for ForFarmers, says it is as cereals are pushed that the acidosis risk is high. John says: "Increasing cereal intakes always comes with the danger of acidosis. So, adding Levucell at this stage will improve fibre digestion and stabilise rumen pH, all of which will improve feed conversion efficiency and lead to better weight gain". Remarking on the overall cost of the ration, Rob says it works out at £1.80/head/day for finishers and £1.48/head/day for growing cattle. He says: "It is not a particularly cheap ration, but it is all about performance. With a cheap ration, you are not getting the performance. It can work out more expensive than a dearer one in the long-term." Further proof of the ration's success is seen in grades of cattle which are dominated by R grades, with the occasional U and O, from Linden Foods at Burradon. Rob says: "There is a penny or two to be made from it, but it all comes down to performance. Finishers certainly look healthy on this ration. They have firmer manure, with less grain in the sample and just seem full of bloom." Because of this success he says he hopes to introduce Levucell to baby calves as they undergo their major transition from calf pellet to TMR. Achieving consistent finishing weights as efficiently as possible is fundamental to the continuing success of Welsh farmer, Aled Williams', beef enterprise. Getting calves off to a strong start and achieving good, early weight gains is essential to maintain the success of a beef enterprise. It is equally important that youngstock, and any stores brought on to farm for finishing, transition smoothly onto final, finishing diets, without rumen upsets and resulting growth checks.